Want to satisfy your salty, savory, sweet, crispy and cheesy cravings all at once? Look no further than this Southern-inspired brunch champ. 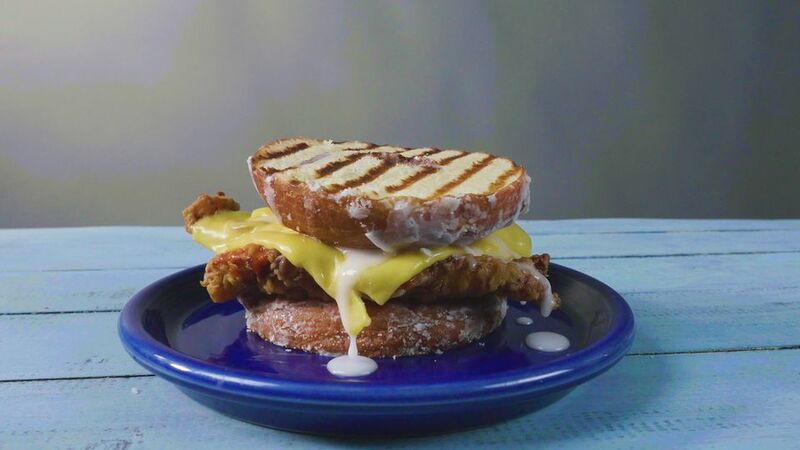 Buttermilk fried chicken breasts are topped with cheese and served in a grilled donut. Be sure to bring the sandwich together while the donut and chicken are still hot to maximize the cheese-meets-sugar melty madness. Beat egg in a bowl with milk. In another bowl, mix flour, cornstarch, salt, pepper and cayenne in a bowl. Dunk chicken in liquid mixture, then flour mixture, then add to the hot oil and fry until golden brown and chicken cooked through. Set aside. Slice donuts in half, spread butter on insides and place cut side down on griddle until toasty. To assemble the sandwich, first put donut halves, grilled sides on the outside. On one piece, top with 2 pieces of fried chicken, a few dashes of hot sauce, add several slices of cheese, then top with the other donut half to close the sandwich.